Sunil Perera the famous musician and leader of the band Gypsies said that he fears for his life if the Mahinda Rajapaksa led UPFA party wins the upcoming General Elections and comes back into power. 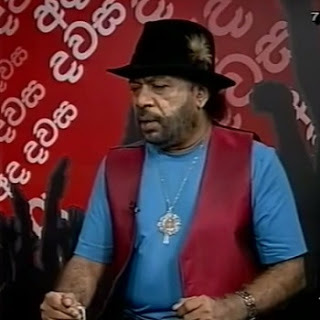 The ‘bring back Mahinda movement” has only one objective ‘Paliganeema’ or ‘revenge’ said musician Sunil Perera in an interview with Swarnavahini, a local television station. The famous musician fearlessly went on a tirade against the former President Rajapaksa’s party members, even calling them thieves and murderers who are protected by a man who is greedy for power and who even made every attempt to continue to stay in power forever. He in fact praised the good work done by Anura Kumara Dissanayake and the Janatha Vimukthi Peramuna for factually exposing the misdeeds and corruption of the Rajapaksa regime and helping in orchestrating the current change of freedom Sri Lankans now experience.”I am surprised that Dissanayake is still alive right now and I also doubt if this is the real Anura Kumara Dissanayake who is among us at present” he went on to say. “Take the late Nelson Mandela from South Africa for example. He came into power, served his time and handed over the reigns to the younger generation to take the country forward. Mahinda Rajapaksa should taken a cue from our very own cricketing global icons in Mahela Jayawardena and Kumar Sangakkara. They too relinquished their captaincies and authority and groomed a youngster to take over”. “We gathered together and ousted Rajapaksa on the 8th of January 2015 and I really cant understand as to why the current President Maithripala Sirisena even went on to give him a nomination to contest the upcoming general elections. We have to rally together one more time and defeat him for good” went on the famous band leader of the Gypsies. The Maithripala – Wickremesinghe are doing things the correct way to punish those corrupt officials of the former regime. “You cant complete an inquiry and prosecute them in a few months. It takes time. Perhaps if the roles were reversed Rajapaksa would have thrown everyone into jail as and when he pleased. We saw him do it to our current Field Marshal Fonseka”. “Please scrutinize the ill gotten wealth of the politicians in your area and if they have big houses and expensive cars, that means that those were all ill gotten wealth. Don’t vote for them as they will continue to plunder this country”. He went on to say that even one Minister openly confessed that he had sold his car permit for Rs 15 million to a third party. The government should stop the issuing of vehicle permits to politicians as it is not necessary. Give them a car and fuel just to do their work whilst in office he went on. ” These are the very same politicians who are now distributing money to the poor to garner their votes. It is only they that play ” Rajapksa won the war” ticket drumming up support to bring the former president back. Perera also went on to say that the fathers who stole money would end up making the mother’s of their children weep as they will be punished for their acts of corruption, theft and murder. ” Even though the politicians of the former regime do have their children educated overseas, it is been funded with ill gotten wealth. Their children and their children’s children will all suffer the consequences for this” said Perera. Perera also touched on the subject where Journalist Lasantha Wickrematunge and the mother and daughter from Kotakadeniya who were slaughtered and slain. He said that those murderers were still at large and even though they are currently escaping being punished on earth, they cannot escape the punishment that would be meted out to them from the heavens. It was the same fate that Mahinda Rajapaksa suffered when he was ousted from power in January. ” Even the life of a foreigner was not spared when they killed Britisher Khurram Skeikh” he said. We now have freedom to express ourselves and we can even slander the President or Prime Minister fearlessly as there is a judiciary who will punish us if we are wrong. During the time of the the Rajapksa rein we could not say a word. We need systems and procedures in place and we must also find ways to stop politicians from crossing over from one party to another to suit their own benefits. “The power should remain with the people and not with the politicians. We would not hesitate to gather once again and throw out even our Prime Minister Ranil Wickramasinghe if he is wrong” said Perera.